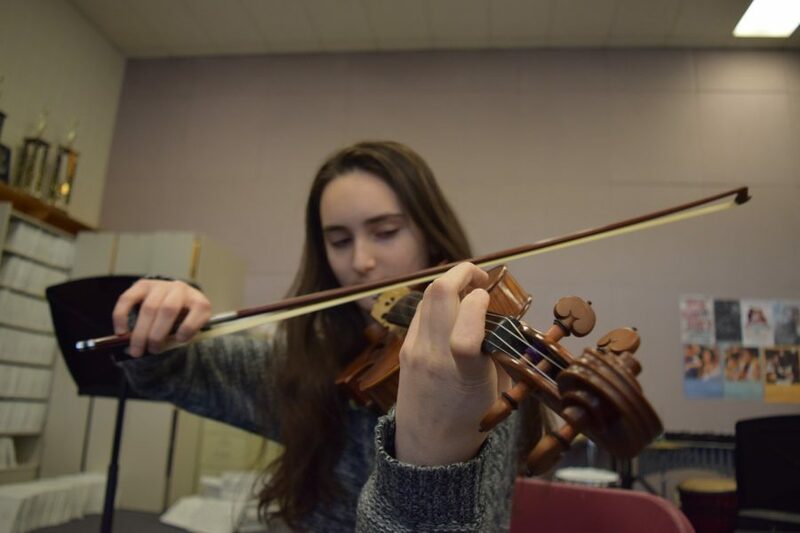 Senior Manya Aronin has been playing violin since she was three years old. Photo by Rachel Hazan. When Aronin was three years old, the roles were reversed. She sat in the crowd in awe of the violinist on stage at a Detroit Symphony Orchestra concert for young audiences with her grandparents. After the show, she had the opportunity to see the backstage workings of an orchestra and fell in love with the violin. A year later, her grandparents surprised her with a violin of her own, and since then, it has remained an integral part of her life. As Aronin has gotten older, she has a lot to balance between music and school; she practices for four hours a day and takes lessons once a week. But the work and time commitment is a small price to pay for the satisfaction the violin provides her, she said. Sometimes, her rigorous practice schedule comes before her social life. Manya’s mother, Alana Aronin, said that Manya’s intense commitment to her violin allows her to tackle any difficult musical piece. Manya Aronin has experienced tremendous success in her violin career already, performing at Carnegie Hall and countless other prestigious venues. Two summers ago, Aronin was one of 10 musicians chosen to attend Interlochen, a six week summer camp, on a full scholarship. Despite her abundant experience and many achievements, Manya Aronin still feels pressure while performing on stage. With time, however, she said that it has become easier to handle the stress. Aronin is currently auditioning for conservatories—schools devoted to preparing students for careers in music. In general, conservatories only offer music classes, yet there are some academic requirements as well. Despite the stress of auditioning, Manya Aronin continues to play for herself.